This blog post from Summer Dental in Las Vegas addresses one of the most feared dental procedures: the notorious root canal. But guess what? They don’t live up to their bad reputation. If you are told you need a root canal, don’t panic. We recommend this procedure when it is better for your tooth than the alternatives. A successful root canal (or endodontic treatment in dental-speak) can save a tooth and prevent the need for an extraction, followed by a dental bridge, dental implant, or gap in your smile. If, after a thorough evaluation, we determine that a tooth is going to need a root canal, we will explain the procedure and costs that are involved. Root canals are performed to save an infected tooth. If not treated, abscesses and complete tooth loss may occur. During the procedure, the nerve and pulp of the infected tooth is removed, and its interior is cleaned and disinfect. The next step is filling and sealing the cleaned area with a special rubbery material, and then protecting the restored tooth with a crown or filling. Root canals have the reputation of being painful, but this is not the case anymore. There are several effective pain management methods available today at Summer Dental. From local painkillers and numbing agents to sedation, we make sure you are comfortable. Once the infected tissue is removed, we will focus on helping the site heal, which may require another visit. At Summer Dental in Las Vegas, our services include root canals, and general dentistry. Schedule an appointment with us today. Root canals have a bad reputation. Just hearing the words “root canal” make a lot of people uneasy, because they associate them with pain. But at Summer Dental in Las Vegas, we stress that root canals do the opposite: they don’t cause pain, they relieve it. A root canal usually becomes necessary when a tooth is infected or badly damaged. Formally known as endodontic treatment, root canals involve cleaning the inside of the tooth by removing bacteria, soft tissue (called pulp), decayed nerve tissue, and any debris. When that’s finished, the tooth is sealed and a crown is placed over it. Root canals are done on teeth that are very sick, and if they aren’t performed, the tooth will probably die. Even more ominous are the blood-borne infections that spread through the body because of the infected tooth. The tip-off that something is going on with one of your teeth may be as ordinary as a toothache. That ache is telling you something, so you should never ignore it. Schedule an appointment with us right away. Remember, root canals are nothing to fear. In addition to root canals, Summer Dental in Las Vegas provides general and cosmetic dentistry, pediatric dentistry, and orthodontics. Call our office today to schedule an appointment. When a tooth is threatened by acute decay, periodontal disease, or damage from an injury, a skilled dentist or endodontist must make a judgment call concerning the course of treatment. If the pulp of the tooth is infected or inflamed, a root canal is usually the only way to save it. During a root canal (or endodontic treatment), the soft tissue in the root of the tooth is taken out. This tissue contains veins, arteries and lymph vessels. Once the roots are cleaned out and widened, they are filled with a special rubber material. 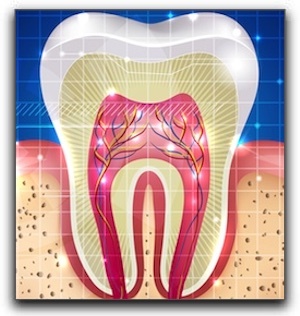 The root canal is only the primary step in the complete tooth restoration. After the root canal, without a crown, the tooth will become dry and brittle. The final procedures are the core build-up and crown. At Summer Dental we have strong, natural-looking crowns that blend with the surrounding teeth. With proper oral hygiene and regular checkups and cleanings, a tooth with a filled root can often function trouble-free for the rest of a patient’s life. Summer Dental in Las Vegas provides root canals, general and cosmetic dentistry, and pediatric dentistry. Schedule an appointment with us today.